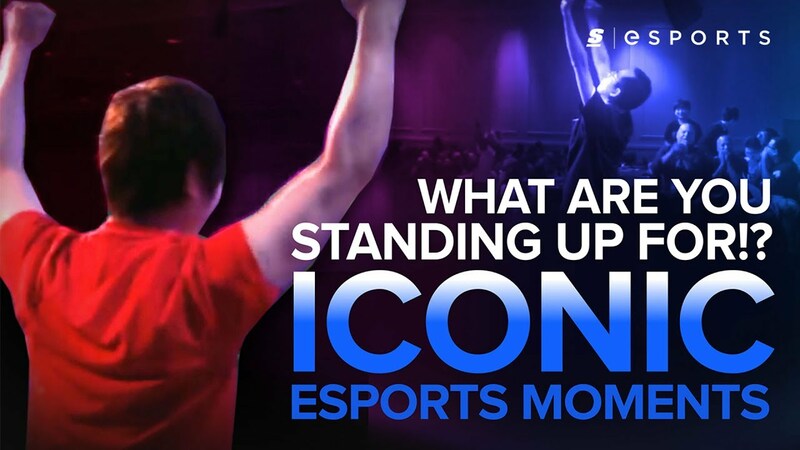 The Most Iconic Esports Moments: What are you standing up for? There comes a moment in any competitive match where the adrenaline overtakes you. You lose control and surrender yourself to the game, to the hype, to the crowd. It's a moment that amplifies every decision you make, good or bad. But no one has ever surrendered themselves to the hype quite like Ryuichi "Woshige" Shigeno, and no one has ever made a worse decision in that moment. It was the Evo 2015 Guilty Gear: Xrd -SIGN- Top 8 Winners' Semis, both Woshige's and his opponent's, Kenichi "Ogawazato" Ogawa, first match of the night. The two were formerly teammates, and knew each other's playstyles well. Woshige played Millia Rage, a fast, highly-mobile character that specializes in throwing out fast attacks as the opponent is getting up from a knockdown to mix them up and secure another knockdown. Ogawa played Zato-1, a complicated character designed around controlling both Zato and Eddie, a shadow creature that lets Zato stick his enemy between two opponents at once, creating pressure that's difficult to block. Woshige's strategy was simple. He was going to use Millia's Silent Force dagger toss to snipe Eddie early in each round and set up his knockdown vortex. Meanwhile, Ogawa wanted to avoid the snipe and stop Woshige from jumping around the screen with Eddie. Game 1 went to Ogawa, but Woshige bounced back quickly. He adjusted to Ogawa's timing on summoning Eddie and stuffed the shadow every time it appeared, leaving Zato helpless in the corner. Game 2 was all Woshige, but the momentum wasn't in his favor. Round 1 of Game 3 started fast with another hit onto Eddie, but Ogawa took back control and slipped out of the corner and kept her at mid-screen for the rest of the round. Woshige needed Round 2 to stay in the game, so he played aggressive, dashing straight into Ogawa and effectively ignoring Eddie. It worked. He locked Ogawa in the corner and closed out his combo with Millia's Winger Overdrive, a special move that the opponent can't escape at all. It was a brilliant way to end the round. It did the maximum damage he could pick up in that situation, it negated all of Ogawa's resources and it kept him in the match. But Woshige lost count. The rounds were close and tense, and Guilty Gear is such a fast game, sometimes it's hard to know exactly what the set count is. Remember, Woshige and and Ogawa were 1-1, and both players were at match point, 1-1 in rounds in Game 3. Woshige's brilliant play was the moment he surrendered himself to the game and the hype. He popped off. But the match wasn't over. While Woshige stood up and milked the crowd, Ogawa stayed seated and killed Millia with a combo into stun. The match was effectively over before Woshige sat back down. Ogawa popped off, capping one of the most perfect moments in FGC history. "What are you standing up for" inspired memes, made headlines and got Guilty Gear onto SportsCenter. It's a legendary moment, and it's all thanks to one, history-altering decision. Daniel Rosen is a news editor for theScore esports. He plays Johnny, but the siren call of Jam's low-tier nonsense is growing too strong to resist. You can follow him on Twitter.